We, the members of Park Avenue Congregational Church, United Church of Christ, as an expression of our Christian love for all God’s people, declare ourselves to be an Open and Affirming congregation. Open and Affirming is the UCC designation for congregations that make public statements of welcome into their full life, leadership and ministries to persons of all sexual orientations and gender identities. We welcome all people into our community of faith, embracing differences of sexual orientation, gender identity, marital status, race, ethnicity, mental or physical ability, age and socio-economic background. In our calling to express the love and welcome of Christ, we affirm the dignity and worth of every person. 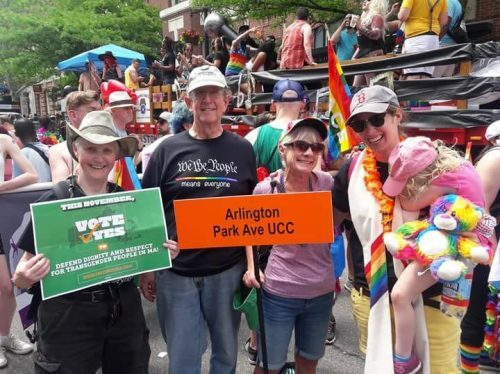 Members of PACC’s ONA Working Group marched with Open and Affirming Congregations of the UCC in the June 13, 2015, Boston Pride Parade. The UCC confers an Open and Affirming designation on congregations, and the Open and Affirming Coalition of the UCC advocates for the lesbian, gay, bisexual and transgender community in the UCC, and equips UCC congregations to become effective witnesses to Christ’s extravagant welcome.